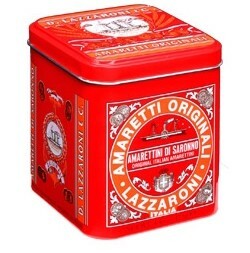 The petit version of the distinctive Lazzaroni tin holds 4.4 ounces of little bite-sized Amarettini di Saronno cookies. Pair with a fine coffee from J. Martinez & Company for a truly pleasurable experience. Net Weight: 4.4 oz Dimensions: 3 ½" x 3 ½" x 4"